The first time I had this soup I was at the 25th Anniversary of the Reader Exchange Party thrown by the Tulsa World. Linda Fraizier made this soup and it was soo good I rushed home to make it! The only thing I do different is I use Italian pork sausage. You have to try this soup! It is so cold on Beaty's Creek that I am wearing socks with my Birks today. Note, I never wear socks! We eat this with homemade french bread. Brown sausage and bacon with onion and garlic. Once sausage and bacon are cooked add broth. Scrap bottom of pot to release all the goodies the bacon and sausage left behind. At this time add the potatoes cook them until fork tender. This will not take very long. Once the potatoes are done add the kale or spinach. The greens will wilt very fast, so don't be scared that you added too much. Right before serving add your half and half. RIGHT BEFORE SERVING ADD THE HALF AND HALF! If you add it any earlier you will have soured half and half in your soup. Yuck!! I did this the first time I made the soup and was very sad to throw it out but that is what I had to do. Make some homemade bread and enjoy! 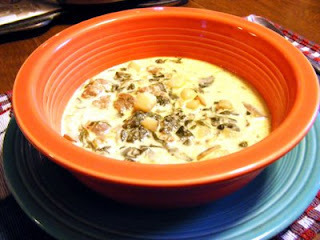 I LOVE zuppa toscana and I'm so glad to finally see a recipe for it. I've seen some others that never turn out quite right. So I will definitely be trying yours. Seems like it'd be a tad bit more healthy using the half and half as well.